Various organizations working under Government of India has invited applications for recruitment under Steno Jobs. Eligible candidates can apply to the post through the prescribed format till 30 November 2016. 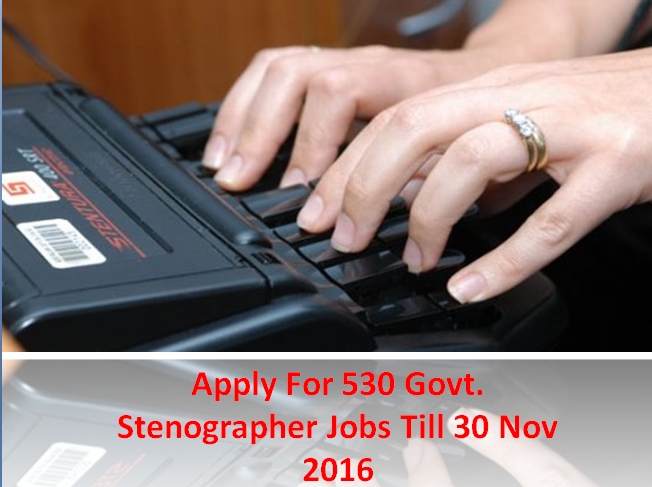 Various organizations working under Government of India has invited applications for Steno Jobs. Organizations like BSSC, High Court of HP, UIDAI and many others have various positions vacant for Steno Jobs. All the interested and eligible candidates who want to be on Stenographer profile and meet the essential educational qualification and typing speed kept mandatory by the organization can apply for Steno Jobs. Applications in these Government Organizations are being invited throughout November. Therefore, candidates willing to apply can view the details advertisement and fill-in the application through the prescribed format with essential documents required, on or before the last date of application. Before applying please go through the prescribed application format along with the essential documents required.